Please no audio and/or video recording of the event per the request of the authors. Wendy Doniger's The Hindus: An Alternative History, recently halted publication in India as a result of a law suit (that was settled out of court by the publisher, Penguin Books India). The suit was based on Section 295A in The Indian Penal Code. Here in Hyde Park, at the Seminary Co-op Bookstore, we wish to support Professor Doniger and appreciate her willingness to discuss this seminal work despite the legal actions in India and the overwhelming media response. Leela Gandhi will act as interlocutor for the event. Reception to follow the conversation. WENDY DONIGER discusses The Hindus: An Alternative History. Wendy Doniger is currently considered a "single author." If one or more works are by a distinct, homonymous authors, go ahead and split the author. 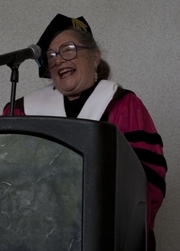 Wendy Doniger is composed of 17 names. You can examine and separate out names.